Despite a rocky first couple of years, OnePlus has really turned things around with its well-praised OnePlus 3, and then later, the just as well-respected OnePlus 3T. OnePlus is expected to deliver again with its next major smartphone release: The OnePlus 5. 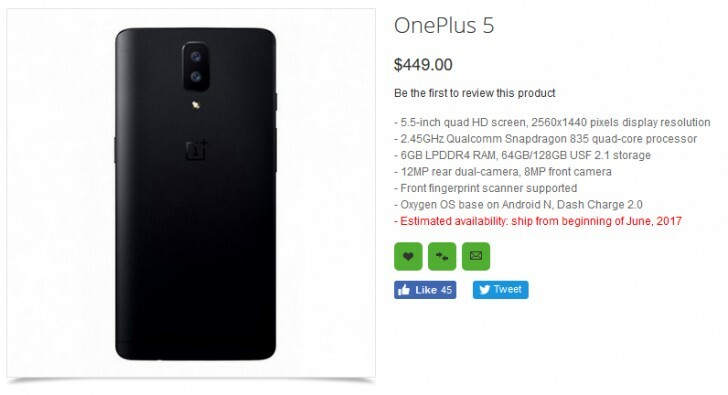 OppoMart has listed the OnePlus 5, complete with specs and a retail price of $449.00. The image used is the same leaked render of a black model with a dual-camera. Though, this model is still alleged and final hardware could look different. Keep in mind these specs are not yet finalized, so they are likely based on previously rumored leaks. There is a well-written description of the phone and its features on the listing. There’s even a section about the supposed use of UFS 2.1 storage for improved app and multitasking performance. A new leak from today also suggests the phone will have a larger 3,600 mAh battery, and there may be an 8GB model available as well. The OnePlus 5T is also said to debut even faster charging than the OnePlus 3T thanks to Dash Charge 2.0, which was mentioned in the listing's description. The listing also estimates availability to arrive “beginning of June, 2017”. OnePlus has already teased the 5 a couple of days ago, so we can only hope that more official news will be coming our way. Stay tuned! Thanks for the tip, Stander7! Snapdragon 835 supports up to 6GB RAM. I'm talking about the screen not the camera.